The question of whether we will see $100 oil before Christmas continues to dominate analytical comment in the financial press. The Iranian sanctions are the main factor that could drive prices substantially higher in the next year or so; however, there are many other forces at work that could lead to lower oil prices. Some are expecting that a large increase in US shale oil production from the Permian Basin combined with higher Saudi and Russian production will create a surplus of oil next year. Others see the increasing prices of oil products in many countries due to weaker currencies as causing a significant drop in the demand for oil products next year. India, in particular, faces threats in the form of a massive current account deficit, a falling rupee, and its position as the world’s fourth-largest oil importer. This situation obtains in many other developing countries. Lower demand combined with whatever comes from the Sino-US trade war could easily overshadow a drop in Iranian exports. A clue that major speculators are uncertain about the future came last when hedge funds cut their bullish wagers on US crude to the lowest level in nearly a year. In addition to the Iran sanction, however, there are still many wildcards out there which could send the oil supply lower in the next couple of years. The situations in Venezuela, Libya, and Iraq are far from stable and could result in lower oil supplies. The OPEC Production Cut: As usual, there is uncertainty regarding OPEC production numbers. According to Reuters, the organization pumped 32.85 million b/d in September, up 90,000 b/d from August’s revised level. However, the Platts survey of analysts says that OPEC increased its production in September to 33.07 million b/d, a 180,000 b/d rise from August. Early estimates of OPEC and even US production are unreliable as we see in the weekly surveys of analysts concerning US inventories which are frequently off from the EIA actual counts by significant amounts. Several OPEC members have political agendas in reporting their oil production figures, so even the official numbers have political biases. Saudi Energy Minister al-Falih said OPEC is technically able to raise oil output by 1.3 million b/d, the TASS news agency reported on Thursday. Whether an increase of this size ever comes to pass remains to be seen. The Saudis usually couch discussions about spare capacity by saying it will only be used if there is sufficient demand. Last week, the US accused OPEC of withholding 1.42 million b/d of spare capacity from the world market and was driving up prices as a result. The US and OPEC appear to be talking past each other when it comes to the cartel’s spare output capacity. The two sides don’t agree on the definition of the term, let alone how much spare capacity OPEC even has available. While Saudi Arabia and its allies have much reason to help the US in its sanctions on Iran and would like to see higher oil prices, they realize that when prices get too high demand drops. As we have seen several times in the past few decades, low spare capacities usually drive oil prices much higher until reduced demand brings them back down again. Rise by up to 3 million barrels of oil equivalent per day. Possibly produce up to 5.4 billion barrels of oil equivalent per day. Have a need for up to 41,000 new wells (mostly unconventional) to be drilled to meet production outlook. Require more than $300 billion in capital expenditures. The report called the demands on infrastructure “tremendous,” citing trucking, roads, water usage, power consumption, sand to frack wells, and community services like housing, schools, and hospitals. The biggest problem will be the $300 billion in capital for an industry where few have ever shown a profit and costs are rising. The biggest hole in the report seems to be an absence of concerns as to whether affordable oil will be available in the highly productive “sweet spots” to permit a doubling of production. Analysts have noted that productivity per foot of horizontal well is already dropping and that the rapid depletion of production from existing wells is already approaching that of production that can be increased each month. To assume that the industry can drill and frack new wells at an ever-increasing pace seem far-fetched. Some are already forecasting that 2019 will see the peak of oil production due to increasing logistical difficulties and a lack of profitable places to drill. There are also concerns as to whether the very light shale oil, which is better for making gasoline than heavier diesel and jet fuel, will be as much in demand. In a recent article, Wood Mackenzie’s VP for Chemicals and Oil Markets warned that US refiners might very soon find themselves stuck with excess production of gasoline that exceeds demand. At the same time, to make matters worse, the production slump in Venezuela is reducing the availability of heavy crude needed for the middle distillates necessary for economic growth. Iran: China’s top refiner Sinopec is halving its oil imports from Iran as of September, bowing to pressure from the United States, which is seeking to bring Iranian oil exports down to zero. Tehran is scrambling to find ways around the sanctions which seem on track to be more effective than analysts had believed. The success of the sanctions program has caused Washington to reevaluate its announced policy of no waivers for countries who are willing to make cuts in their imports of Iranian oil. At week’s end, Washington was “in the midst of an internal process” of considering sanctions waivers for countries that reduce but do not entirely stop importing oil from Iran. According to the head of the state-run National Iranian Oil Company, Iran has no plans to cut oil production as its exports dwindle. In a new wrinkle, Iran plans to start offering oil for exports via its national stock exchange. Iran accused Saudi Arabia and Russia last week of breaking OPEC’s agreement on output cuts by producing more crude oil. Tehran is saying that the two countries are not able to provide enough oil to make up for a reduction in Iranian exports. As Iranian natural gas sales are also prohibited under the sanctions, Tehran’s hopes of boosting exports of the commodity do not look good. Iran holds the second-largest natural-gas reserves in the world and was hoping to start selling natural gas to the European Union this year. Iraq is having trouble continuing its natural-gas purchases from Tehran because banks are reluctant to carry the payments due to the US restrictions. Iraq: Baghdad earned $7.91 billion in oil revenues in September, its highest take in 52 months, despite a small decrease in Basra Gulf exports. Nationwide, exports dropped two percent month-on-month, from 4.02 million b/d to 3.95 million, as Kurdistan loaded fewer tankers despite increased pipeline flows to the Ceyhan port in Turkey. Despite the Oil Ministry’s optimistic report on the country’s capability to ramp up production, internal political issues could lead to new crises soon. Last week Adil Abd al-Mahdi, Iraq’s former oil minister, was named prime minister-designate on Tuesday, hours after Barham Salih was elected president of Iraq in a political standoff. The controversy surrounding Barham Salih’s election as the new president is threatening to destabilize a strategic relationship between the autonomous Kurdistan region’s two leading political parties. This, in turn, could lead to still more trouble between Erbil and Baghdad. In an ominous development which could have serious consequences for the future of Iraq, the agriculture ministry said last week that it would reduce its 2018-2019 winter crop planting area by 55 percent due to a water shortage. Water flowing down the Euphrates into southern Iraq has been declining in recent years and is now down to the level where food-planting must be curtailed. Saudi Arabia: The issue of how much spare production capacity the Saudis have and can sustain remains the question of the day. Saudi officials insist that they can produce up to between 12.0 and 12.5 million b/d if needed; however, there is widespread doubt that level of sustained production is possible. Last week oil minister Khalid al-Falih said that the kingdom currently is producing 10.7 million b/d and has about 1.3 million b/d of spare capacity. Falih said Saudi Arabia’s November output was likely to be slightly higher than October’s projected 10.7 million b/d. He also said that the kingdom plans to invest $20 billion in increasing oil production in the coming years. Once the US sanctions on Iran go into effect November 5, Platts Analytics expects Iranian crude and condensate exports to fall to 1.1 million b/d, and to 800,000 b/d by the fourth quarter of 2019, down from 2.91 million b/d in April 2018. Russia pumped at record high levels in September, producing 11.35 million b/d, and energy minister Alexander Novak said Wednesday that his country could add up to 300,000 b/d in the next several months. Kuwait and the UAE are increasing production, but it is doubtful any other countries can respond quickly. Later this coming winter, we should have a better idea of how much the sanctions will cut Iranian production and whether OPEC and Russia can make up for the shut-in Iranian oil. A $200-billion solar power project that was planned to be the largest solar farm in the world might never happen, government sources told the Wall Street Journal last week. The solar project would have had installed capacity of 200 GW by 2030. However, the WSJ sources said, nobody is working on the project, and the government is planning another set of renewable energy initiatives, to be made public later this month. Saudi Arabia’s crown prince says the plan to sell shares in Aramco will go ahead, promising an initial public offering by 2021. For the past two years, Saudi Arabia has been preparing to place up to 5 percent of its national oil company on the stock market. After months of setbacks, the prince’s father King Salman stepped in to shelve the project. As the trade conflict intensifies, new data shows that privately owned makers of cars, machinery, and other products stopped expanding in September, as export orders dropped the most in more than two years. Output by large, state-owned manufacturers also continues to weaken. The first major gauge of China’s economic performance for the third quarter indicates that the U.S.-China trade fight is beginning to take a bigger bite out of the growth of the world’s second-largest economy. US crude oil shipments to China have “totally stopped,” the President of China Merchants Energy Shipping Co (CMES) said on Wednesday. Washington and Beijing have placed steep import tariffs on hundreds of goods in the past months. Although US crude oil exports to China, which only started in 2016, have not yet been included, Chinese oil importers have shied away from new orders recently. China is raising the oil import quota for its non-state refiners for 2019 by 42 percent as new refinery capacity will start up next year. China is allocating a total of up to 4.06 million b/d, of import quota to non-state refineries for next year according to a communication from the Chinese Commerce Ministry. This suggests that Chinese demand for imported crude will continue to keep pressure on the oil markets. Russia’s crude production in September hit a record high of 11.356 million b/d, exceeding the level of October 2016, the benchmark Moscow used for cutting production under the deal with OPEC. Crude production was up by 146,000 b/d from August. Russia’s crude exports outside the 11 former Soviet Republics fell by 1 percent to 4.798 million b/d in September. While Russia is producing oil close to post-Soviet highs, because of transportation constraints, it can’t significantly increase its oil supply to Asia, where the loss of Iranian oil exports is being felt, according to deputy energy minister Pavel Sorokin. In Europe, Russia’s Urals is considered to be one of the best replacements for Iranian grades. 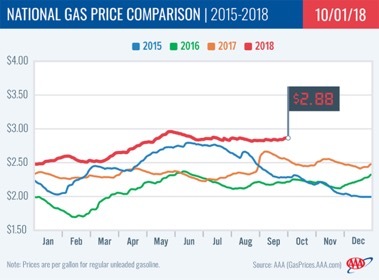 The price of Urals compared to Brent to which the Urals deliveries are priced off has recently jumped to a five-year high, as European refiners were starting to search for alternative grades to replace imports from Iran. This has also prompted Saudi Arabia to raise last month the prices for Europe for its flagship Arab Light crude grade for October. Global energy executives assembled in Moscow on Wednesday said the world needs Russian gas to keep the lights on, in a clear message to US President Trump who has warned he may impose sanctions on Russian gas export projects. Trump, citing what it calls Russia’s “failure to act as a good global citizen,” says the US may take steps to block the Nord Stream 2 gas pipeline, which will increase the volumes Russia can export to northern Europe. The US position has prompted a backlash from the Kremlin, and from business groups in Germany, and now from leading figures in the global energy industry. The country’s leading newspaper notes that after 58 years of independence from Britain, the state of the Nigerian oil industry has remained pathetic among other oil producers. The Nigerian system, regrettably, is supported by obsolete laws: Petroleum Act 1969; Petroleum Profits Tax Act 1959; Deep Offshore & Inland Basin (Production Sharing Contracts) Act, and sundry ad hoc legislation. Other African countries are making giant strides in the quest to regulate their oil industry and optimize the dividends from the industries. Former World Bank Vice President, Oby Ezekwesili, said it was unfortunate that Nigeria overtook India in May 2018 to become the country with the world’s highest number of people living in extreme poverty amid enormous oil and gas reserves. India’s population of 1.3 billion people now has 5 percent of its population living in extreme poverty. Nigeria with a population of about 191 million has 44 percent in extreme poverty. Without the requisite laws to coordinate the oil/gas sector, issues like lack of transparency/accountability; low participation by indigenous players; political interference with the Nigerian National Petroleum Corporation; inefficient downstream operations; funding constraints; weak and dependent regulator; overlapping institutional roles; revenue management issues; outdated laws; and environmental degradation, will continue to plague the Nigerian oil/gas space. Repairs to a dock at Venezuela’s main oil export port will take at least another month to complete following a tanker collision more than a month ago. The Jose port’s South dock is one of three used to ship heavy and upgraded oil to customers including Russia’s Rosneft, Valero, and Chevron, and to receive diluents needed for the exports. Jose port typically handles about 70 percent of Venezuela’s total crude exports, which in September declined 14 percent compared with the previous month to 1.105 million b/d, according to Refinitiv Eikon data. The delay in resuming shipments is due to insufficient funds to make repairs, partially thanks to US sanctions, which have essentially closed access to foreign funding. China, not bound by these restrictions, recently agreed to a US$5-billion lifeline for the Venezuelan government and its oil industry, but this money will take time to become available. Venezuela has officially launched its state and oil-backed cryptocurrency, El Petro, which analysts and experts see as nothing but a scam and another effort to skirt sanctions. The domestic situation is desperate with 60 percent of the population saying they have lost weight due to the lack of food. Some 2 million people out of a population of 31 million have already left the country — and more are leaving the country, at a rate exceeding 15,000 per day. The Maduro government, which has already survived months of mass demonstrations by killing hundreds of protesters, has blocked five military coup attempts. A Cuban-run intelligence apparatus has proved brutally effective in rooting out internal opposition: Some 600 military officers are believed to be under detention, and much of the civilian opposition leadership has been jailed or driven into exile.